If you've been longing for an extended piece of music that brings to mind both Genesis ("Supper's Ready") and Hatfield and the North ("Mumps"), you're in luck with Regal Worm's "6:17PM: The Aunt Turns into an Ant" with its ten sections, each amusingly titled and telling a story full of bizarre imagery and quirky music. Jarrod Gosling's eccentric take on progressive rock has a lot of the light, pseudo-jazzy touch the Hatfields excelled at (as well as their penchant for absurd titles), though you probably wouldn't want to say Use and Ornament is a Canterbury album. There are many moments that sound more psychedelic than prog, as with "Apple Witch" and "Morning Sentinel," but then you get "Confession from a Deep and Warm Hibernaculum," the album's other lengthy suite, which has some out-and-out prog of the best kind. Complex but not pretentious, unpredictable but not random. Gosling plays the vast majority of the instruments himself, with an emphasis on drums and vintage keyboards, plus bass, guitar, and a wide variety of other noisemakers; guests provide woodwinds, brass, strings, voices, and so on from time to time. How he managed to get such a natural, organic sound with so many overdubs is a marvel in itself. There are also sections of experimentalism, as in the middle section of "Hibernaculum," where it seems as if we're on a spaceship leaving the Solar System, listening to old radio broadcasts from Earth that have been garbled in transmission. Or maybe a better metaphor would be a sleeper in suspended animation with bits of memories and dreams drifting around in his subconscious mind. Use and Ornament is the kind of puzzle that will keep revealing new twists and details with each listen, a work of twisted genius that strikes a perfect balance between catchy tunes and experimental weirdness. And has lots of Mellotron. 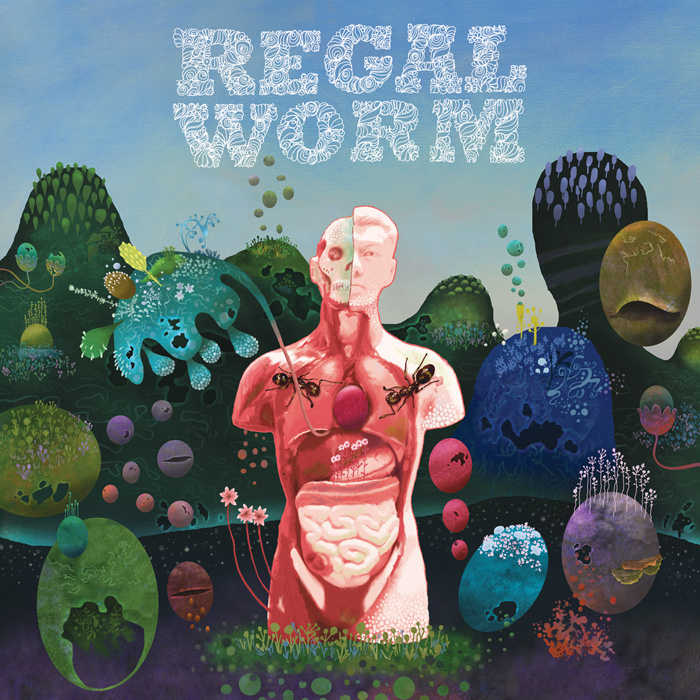 Regal Worm is the brainchild of Jarrod Gosling from the UK with a long and varied musical career starting with hard rock/metal as a teen, to indie and dance music at college, and moving on to weird electronic 60s sounding pop music in the 90s. In the first decade of this century he started remixing artists such as The Divine Comedy, Pulp, and Goldfrapp, and his music was used in TV shows, films, and advertisements. About ten years ago he started purchasing vintage instruments and eventually decided to try his hand at progressive music, and the one-man band Regal Worm was born. What Jarrod has done is thoroughly study and dissect 70s progressive music and reassemble it into something new. Consequently I find it difficult to describe the results and draw comparisons to other artists as touchstones. Use and Ornament contains ten tracks, two of which are extended pieces: “Confession from a Deep and Warm Hibernaculum” at 13:11 and “6:17 PM The Aunt Turns into an Ant” at 26:11. The other eight tracks are in the one to four minute range. The resulting music sounds very organic, not as if it has been multi-tracked and over-dubbed, with a distinct prog-jazz flavor. In many cases the vocals are unintelligible, which is actually a minor complaint and does not detract from the music. I cannot get really excited with the short tunes. It is not until “Confession from a Deep and Warm Hibernaculum” that I stood up and took notice of the disc. This track consists of five separate and distinct movements that could have been separate tracks. There are many shifts in rhythm, emotions, and style. Plus this the first track that showcases the Mellotron. There is even one section that reminded me of Pink Floyd’s seminal “Several Species of Small Furry Animals Gathered Together in a Cave and Grooving With a Pict.” This track alone is worth the price of the disc. Likewise the other long track “6:17 PM The Aunt Turns into an Ant” has 10 movements. This track is interspersed with narrations, Mellotron, sound effects, crazed sax, and frantic drumming. This is an interesting and excellent track, but not as good “Hibernaculum.” The disc closes with the Zappa-influenced instrumental “Klara Till Slutet (Main Title Theme).” Overall quite an interesting take on modern progressive music.